Maxine's Christmas Carol 2017 season is over. Please click here for a list of shows still performing for 2017 Christmas season. 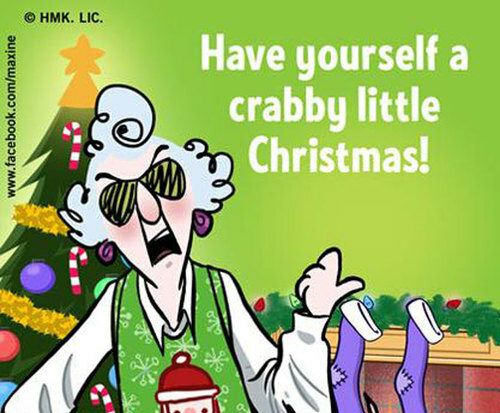 Move over, Ebenezer, because there is a new scrooge in town; revisit a Christmas Carol with one of Hallmark's most beloved (and crabby) characters, Maxine, with Maxine's Christmas Carol in Branson, MO. Maxine started rising to popularity with the introduction of the Maxine hallmark cards. The character is known for her cranky demeanor and 'tell it like it is' sayings, adding a dash of sassy humor to the stage. The perfect choice to portray the role of Ebenezer in the story, Maxine fills the stage with hilarious humor, live music, and an interesting spin on the Dickens classic. Join this hallmark star as she comes to the live stage in one of the most heartwarming (and hilarious) performances of the season. Great show very funny cast meet everyone outside in lobby to sign autographs and take photos.. Didn't know what to expect with this show, but it was magnificent. The performance was good. I enjoyed it a lot. The theatre was terribly cold though. This took away from some of the enjoyment.